Gardening School Courses are open for anyone interested. Those pursuing NGC Gardening Consultant status are required to take the tests. Click here for the PDF Flier with Registration Form. Click here for the Curriculum Guide for Gardening Study Schools. Denise Crissman, Educational Coordinator uses the EnviroScape as a great interactive tool to teach students about the sources of water pollution and ways to prevent it. 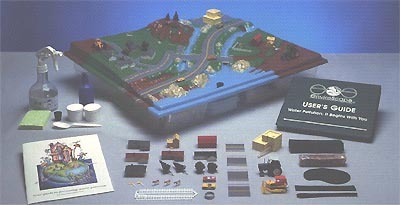 The model is a complete miniature community with a farm, a housing plan, a construction site, a factory, a sewage treatment facility, a timbered out forest, a golf course, a roadway and a connected lake, river and stream. We use various materials to pollute the mode. And the students can actually see how anything that goes into or onto our environment affects it. Children are fascinated by the realism of the model and the opportunity to participate in the demonstrations. The presentation begins with talking about what a watershed is and how our lives depend on clean water. They talk about why they need water and all the ways they use it in their lives. Denise encourages the students to answer questions about Earth the Water planet. How much is surface water? How much is fresh water? What are the three properties of water? Why is Michigan called the Water Wonderland? They look at the map of the River Raisin Watershed and follow the layout of the river to Lake Erie. They discuss the hydrologic or water cycle and talk about surface water and ground water. Then they discuss non-point and point sources of pollution. Denise lets the students use paper, foil, tissue and toothpick pieces to pollute the EnviroScape with trash. They use cocoa powder for loose soil, chocolate syrup for oil and sludge, green sprinkles for herbicides and fertilizers, red for pesticides and yellow for salt on the roads and driveways. After everyone has had a chance to "pollute with permission", they create rain with spray bottles of water and the students can see how the polluted water runs off the land and into the stream, river and lake. The result is very dirty looking brown water filled with trash. They then talk about how they can't swim in the water, how it affects the plants and fish and how it also gets into our groundwater. At the end of the presentation they talk about ways to prevent pollution such as recycling, disposing of trash properly, sharing rides, pulling weeds, natural alternatives to pesticides and environmentally safe cleaners, contour plowing, planting vegetation and trees, etc. They also talk about water conservation such as using less, fixing leaks, turning off the faucet while brushing your teeth, and turning off lights when leaving a room to name a few. Denise encourages them to think of their own ways to conserve water and energy. The students enjoy the participation in this hands-on activity and it gives them a real feel for how our everyday activities affect our environment and our water quality. Hopefully it makes them think about it more and maybe actively take part in keeping our water clean and abundant. For information about scheduling a presentation please call the district office at 734.265.9311. The district also offers workshops and presentations throughout the year. We have technicians on staff that can discuss tree selection, native prairies, invasive plant species, water quality and many other topics. If you have something in mind give us a call.